If your little one is ready to be crowned a princess for her birthday, we’ve got some fun princess party ideas that will make her feel like the bell of the ball! Are invited to join in the party of pink beauties small. Come dressed in your best gown and we’ll fit your for a crown! Crowned Princess: Each princess will be fitted for a crown as they arrive to the party. (This is a fun activity to start with to get the children doing something as everyone arrives). For the crown, I folded a piece of paper in half and cut out a ball shape at the top and zig-zags on the side. Then cut a 2 inch strip and staple it to the first cut piece to complete your crown. You could get crowns from Burger King to decorate or even foam crowns from the craft store. 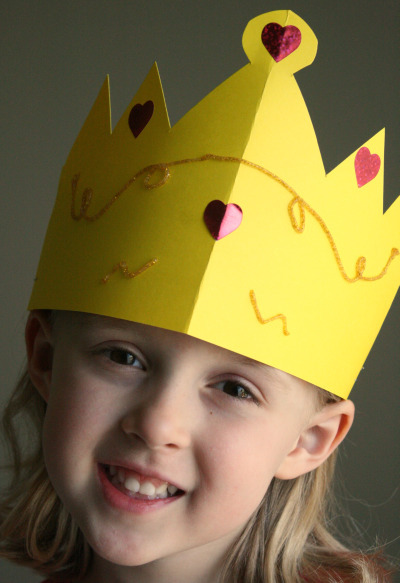 Then let the princesses add stickers or glitter glue to their crowns. Pink cupcakes with a small princess wand stuck in the middle for decoration. Bake a dome shaped cake. Add a barbie princess to the center of the dome, so only the top half of her body is showing. Ice the cake and it will appear that the cake is her princess gown. Here’s an example of what it could look like! Bake and decorate a 2-3 tier cake and add a large silver diamond (plastic) crown to the top. The birthday girl would then get to wear the crown after you blow out the candles. Princess Hot Potato – We have a princess microphone that plays “Bibbidi-Bobbidi–Boo“. We set the children around in a circle, sitting on the floor and one holding the microphone. Once the music on the microphone starts, have the girls pass the microphone around to each other until the music stops. Who ever has the microphone when the music stops gets a prize and then sits outside of the circle until you have a winner. – If you don’t have this type of musical microphone, you can play your own music and have the children pass around a crown or princess pillow instead. 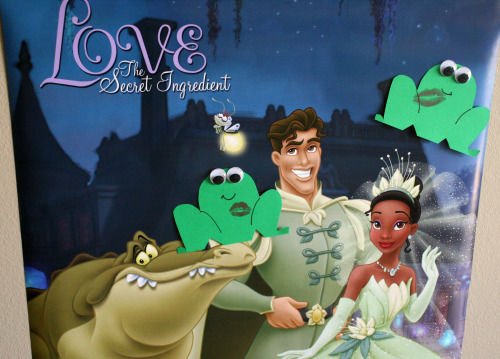 Pin the *kissed* Frog on the Princess – I found this Princess and the Frog poster for $5 in the poster section at the grocery store. We made green paper frogs, complete with googley eyes (I used glue dots to stick them on). We then added a kiss: I put red lipstick on the girls and they kissed the paper frogs. If you don’t want to use lipstick on the girls, you can make them ahead of time or find some kiss stickers. Now try to place your kissed frog near the princess! 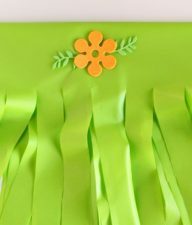 Pin the Kiss on the Frog – You can play this version of the game by making a large green paper frog. Place lipstick on the girls, blind folding them, and have them “kiss”, with their red lips, the FROG! 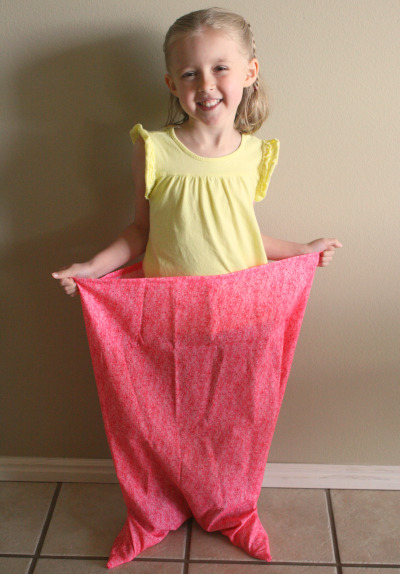 Mermaid Sack Race – You need to make 2 mermaid sacks: sew or hot glue shimmery fabric together in a long rectangle, leaving one end open. You can shape your fabric into a mermaid tail or draw on the fabric with a black marker where the fins would be. For the game: line the girls up in two lines. The first girl in each line wears the mermaid sack. On your mark, they hop down to the end of the course and back, handing off the sack to the next girl in line. Continue playing until everyone has had a turn to race in the mermaid sack. 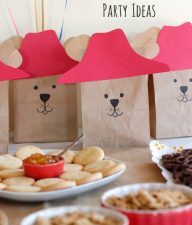 Princess Party Bags: Let each princess go home with a princess party bag. It can be filled with stickers, fruit snacks, ring pop suckers, a small green plastic frog toy, and a plastic necklace and ring. 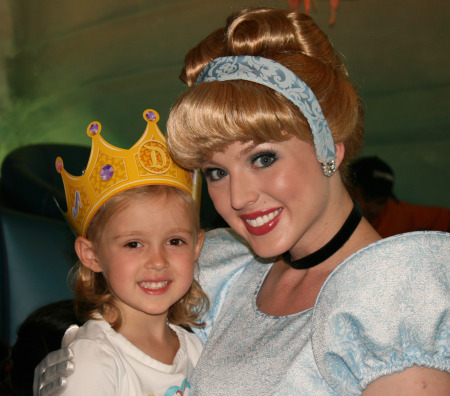 What fun ideas have you done for a Princess Birthday Party? We just had a Brave themed party for my 5 year old daughter. The most exciting a new idea I had was to hire a Look alike to the new character Merida! We found an exact look alike with a company called Look alikes and Characters Entertainment! She was perfect with the long red hair and green medieval dress. She came and played medieval games with them and had themed activities. The whole party was just amazing. I found them on partypop.com out of Atlanta, GA. I found out that they also had a Katy Perry look alike. I will be hiring her for my 7 year olds party! Thank you Look alikes and Characters Entertainment! Hi.. For my daughter’s first birthday I did a Princess Party. Three things that the kids completely loved. I brought a castle online that you could color. It was about 3feet tall by 3feet wide. I set it up and the kids climbed in and out of it and the older ones colored. It was a hit. The second thing I did was make a princess treasure chest hunt. I brought one of the styrofoam coolers and spray painted it gold… (be careful.. I used the wrong paint first time and melted the thing) I brought a 5lb bag of rice and all different kinds of wrapped candy, plastic jewelry, erasers, and I included a couple of special rings. Any child who picked one of those rings got a special prize. (Markers, Crayons, and other assorted gifts) The little ones had a ball with this. After the original game was finished (all the special rings were found) the little ones just played in the rice and found all the rest of the stuff. My last great idea was that I rented a pumpkin coach with two white horses. It looked like a wrought iron pumpkin like Cinderella’s coach. It cost me 500 dollars for an hour but the kids had a blast along with the adults. Everyone got a ride and we took pictures of everyone. It looked especially cute since I gave all the girls crowns and wands. The boys were knights. I found cute plastic helmets online and blow up swords. They were a hit! Hope that helps! Each child was assigned a color for everything they did and a flower (craft foam & popsicle stick) was at each station with a letter on it so once they were all gathered they could spell their name with the flowers. Just some of the activities…. Ohhh! 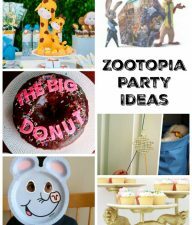 I love the princess party idea. My sister-in-law is actually Aurora for princess parties… she’s got the awesome dress and everything! When I have a daughter, I will use her. Also, Cassandra did a Fancy Nancy party for Tatum (similar to a princess party I would think…But they decorated crystal(like) tea cups as their take home item as one of the activities. It was pretty cool. I LOVE the mermaid sack race. What a cute idea! We love our four years olds. I just also did a princess party in March, but we added special crafts for some knights. We had a fun castle backdrop and I did the wilton castle cake! 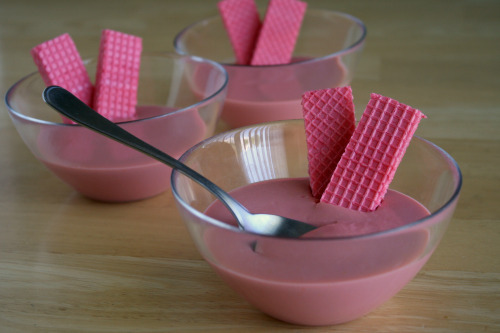 * Some princess punch made from pink lemonade served in princess goblets. We just had a princess tea party at our house last month, here’s my blog entry on it! I am loving birthday week! All of your ideas and are much fun! The mermaid sack race is my favorite. =) I’ll be linking. When I was little I went to a princess party where the parents had created a castle out of an old refrigerator box. With a moat and everything! I don’t remember anything else about the party but that castle was out of this world. p.s. a princess cake would be easy to make: just do a barbie cake and put a crown on the barbie. We actually just did a Princess (& Prince) Party here last weekend. Four years ago we had a princess party for my daughter (but not a character one) and one of the games we played was really popular with the four year olds in attendance. We read the story of The Princess and the Pea and then each girl had to sit on three pillows and see if she could detect the pea (a round wooden ball I painted green). It was a lot of fun! I think it would be fun to focus on the whole magic of these fairy tales. You could have small dowels or straight sticks for the guests to make into wands as they arrive. Simply cover with foil and attach a decorated star at the top. Add glittery pipe cleaners to outline the star. Each girl could write her name on her own wand. The cake could be a representation of a carriage, but I like your doll cake idea in her beautiful gown! What little girl would not love that? One game could be Magical Musical Chairs with princess songs playing. The fishing pond game could be adapted too. Instead of having a ‘fishing pond’ where a sheet is draped and a child puts over a fishing pole and reels in a small toy prize, they could use a wand to magically bring back a fun little princess toy. The treats could include what they call ‘fairy cakes’ in the U.K., but could be renamed ‘Fairy Godmother Cakes.’ This is sounding fun! 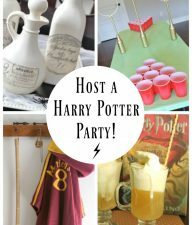 I would want to be a guest at a party like this – still! Here’s a princess cake I made for my daughter.